I've been reading a wonderful book by Jane Kirkpatrick, and it is time to write a review! 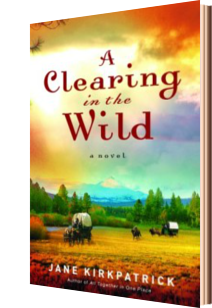 A Clearing in the Wild is a Christian historical fiction title that tells about a group of pioneers on the Oregon Trail. I had read another book by Jane Kirkpatrick, Where Lilacs Still Bloom, that I reviewed on Amazon. My feelings about that book were a bit mixed... in the end, I really loved the book. However, it took a long time for me to "get into" the story, and I found the jumping around from one seemingly independent storyline to another quite distracting. A Clearing in the Wild was quite different. It follows one person, a very young Emma Wagner, beginning with her life in the Bethel colony in Missouri, along the Oregon Trail, and into Washington Territory. As in her previous book, Kirkpatrick certainly seems to have done her research, and she creates characters that just feel real. Emma is clearly the most rounded character, as it is all told from her perspective. I enjoyed this story, and found Emma's struggles to be a good wife really fascinating. I also really enjoy Kirkpatrick's pacing. This isn't a high-action novel, with events compressed into a short time period to make for an exciting tale. Nor do you get all the nitty-gritty of life on the Oregon Trail. The novel covers a fair amount of time, and it feels right. These events could occur in this time period. This book is the first in the Change and Cherish Historical Series, and I will be looking into books two and three, so I can see where Emma does end up.